Shinobi were often tasked with espionage or assassination and “Ankoku Toshi Jutsu” is their legendary technique which allowed them to see in complete darkness. It would take years to master and required the Shinobi to “see” with their other senses. As well as navigating in the darkness, the Shinobi would have to be enveloped into it, themselves. They moved through the night surreptitiously cloaked in a black garb. 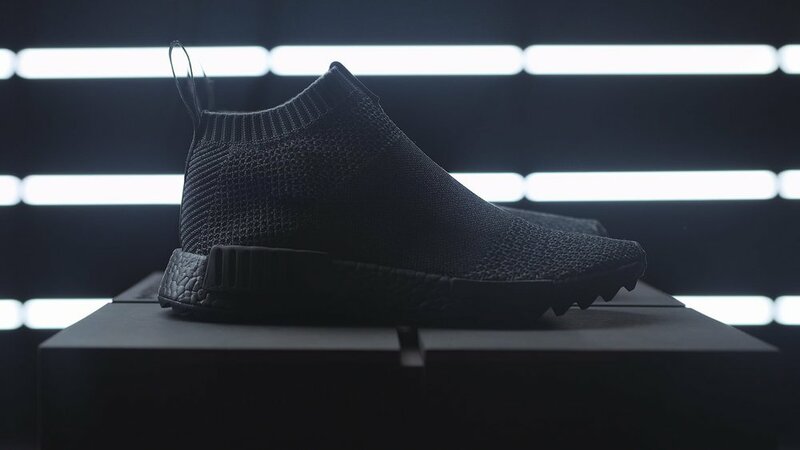 In a contemporary homage to the covert agents of feudal Japan, the NMD CS1 arrives in full-on stealth mode. The Good Will Out picked a theme for its interpretation of the NMD CS1 that couldn’t fit any better. It suits the current trend of exploring the use of functional apparel and footwear in urban environments. This all black NMD CS1 is yet another striking execution of an already iconic silhouette. The upper is constructed from three interconnected Primeknit patterns, all in a single shade of black but with subtly-altering textures. The model’s BOOST™ midsole provides the wearer with further support and cushioning. It is complemented by a rippled outsole which adds extra grip and gives the NMD a tough appearance. Releasing at TGWO on September 16 and selected Consortium retailers worldwide September 23.